Engraving by Cherubino Alberti, 39.2 x 28.2 Line + margin below of 1.6 Line to Sheet (Vienna III?). II. Inscribed at the lower left: Nobili uiro Dno Pompeo Nigrio Bononiensi / Huius Artis Fautori / Dicatum; in the lower middle: Rubeus . Florentinus . inuen. ; and on a block at the lower right: Romae . A – / 1575; and the cipher of Alberti on the edge of rock. III. The inscription at the lower left has been removed, although traces of it still remain. Inscription added in the margin at the bottom, at the right: Ioannes Orlandi formis rome 1602. IV. The name Ioannes Orlandi has been removed. V. Orlandi’s name, traces of which are slightly visible, replaced with Nicolao Van Aelst. VI. Inscription in margin removed. Inscription added at lower left of picture area: Romae apud Garolum Losi 1774. Heinecken, I, 1778, 95. Bartsch, XVII, 1818, 68, 51 (States I and III). Le Blanc, 1854-1890, I, 9, 52 (States II-V). COLLECTIONS: Berlin, 160-20 (III). Florence, Marucelliana, Vol. XIII, 36 (II). London, W3-135 (III). London, Christie’s, Sale, December 4, 1986, lot 24 and Fig. (counterproof of I). New York, 49.95.307 (VI). Paris, Ba 12, p.16 (V); Eb 13 (II). Rome (IV). Vienna, It.I.37, p.36 (IV), p.37 (II); It.II.21, p.75 (III?, bottom margin cut off). Mariette, Abécédario, 1858-1859, 18, as Alberti after Rosso. Kusenberg, 1931, 157, 159, Pl. LXXIX, 3 (Paris). Servolini, 1932, 757, Fig. (Rome). Borea, 1980, 251, 252, no. 635 (Florence, Marucelliana), with implication that it is after a drawing by Rosso of 1527-1530. Buffa, I.B., 34, 1982, 170 (London). Carroll, 1987, 10, 29, 37, 41, 154-159, no. 52, with Fig. (Vienna, IV). Carroll, 1989, 17, 31, n. 16, Fig. 32 (Vienna, IV) and Fig. 33 (London, Christie’s, counterproof of I), as the only print made from a drawing by Rosso that has been extensively enlarged. Franklin, 1994, 255-258, Pl. 204 (London, III) and Pl. 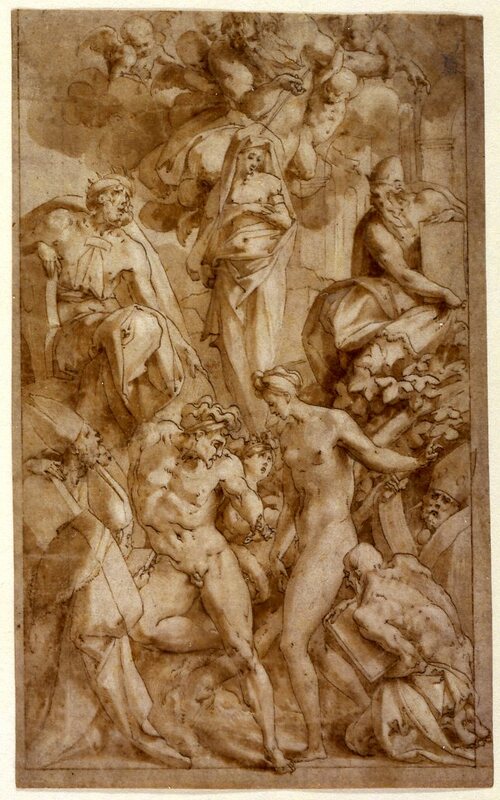 205 (London, formerly Christie’s, I), the two states showing that Rosso’s original lost drawing contained only the figures and an indication of some architecture, such as the columns behind the figures, and a part of the temple, and perhaps the unfurling clouds, a theory partly confirmed by Vasari’s painting of the same subject in S. Stefano dei Cavalieri in Pisa; he would date the image during Rosso’s Aretine period because the cathedral of Arezzo is dedicated to St. Stephen and because he is one of the most popular local saints. Brilli, 1994, 25, Fig. (State III) as after Rosso’s design of 1528. Costamagna, 1994, 80, 208, 210, under Cat. 65, mentioned as Rosso’s in relation to Pontormo’s Martyrdom of the Ten-thousand as reflecting the horrors of the Sack of Rome. Neither the attribution of the print to Alberti nor the inscription on it giving its design to Rosso has ever been doubted. 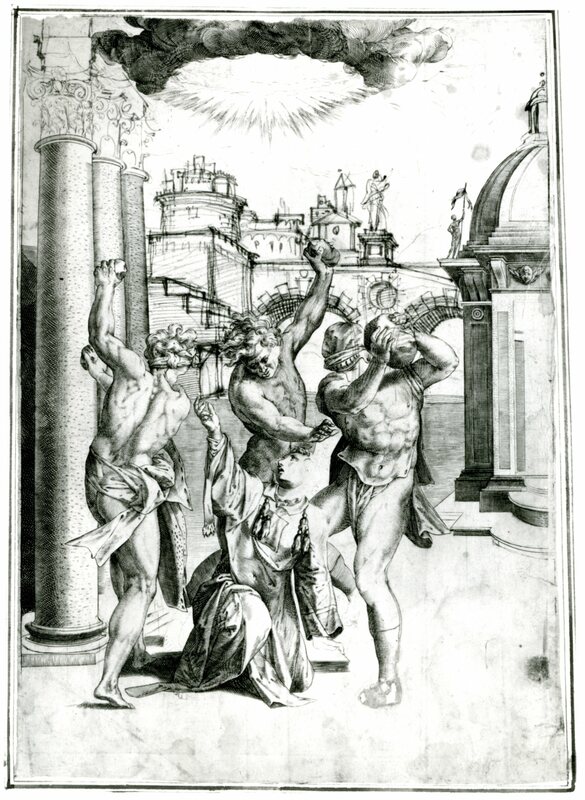 The figures in the engraving are very much related to those in the center of the drawing in Rome (Fig.D.29) made for the Christ in Glory in Città di Castello in the summer of 1528, shortly after the picture was commissioned on July 1. In both works the figures have the same kind of Michelangelesque musculature and similar complex postures and energetic movements. The drapery in both swings out and falls in similar ways, and the wavy hair of the stoner at the right in the print is virtually identical to that of the standing central figure in the drawing. 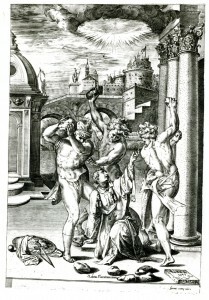 In all these respects, the figures in the engraving also resemble those in the foreground of Rosso’s Allegory of the Immaculate Conception of 1528 in a German collection (Fig.D.30). For stylistic reasons, the Stoning of St. Stephen would seem to have been done around the same time. Vasari does not mention a work by Rosso of this subject, but he does record several instances of his making drawings for projects that were never executed and implies that there were more. Some of these projects were to be executed by other artists. All but one of these designs were made between 1527 and 1530, although only these may be recorded because it was during these years that Vasari knew Rosso personally. An earlier one of a Visitation (L.17) done in 1524 for Lappoli was made in Arezzo, which is one of the reasons why Vasari knew it. 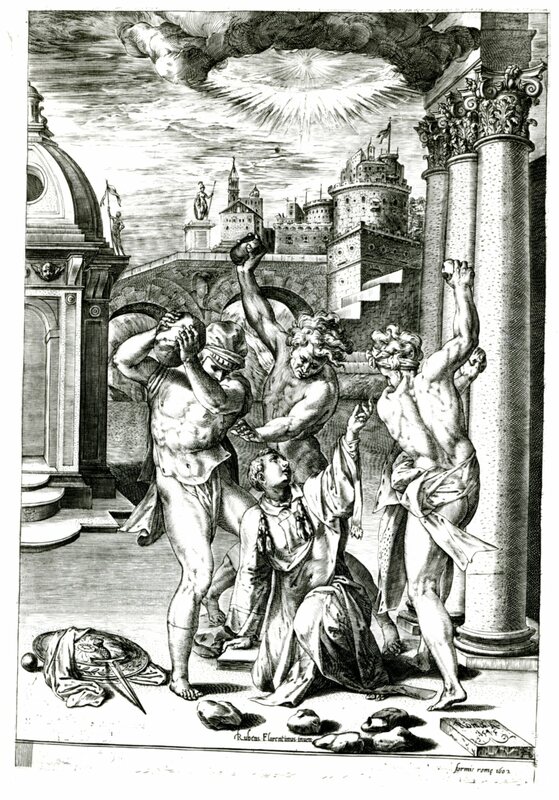 Stylistic and circumstantial evidence supports a date for the Stoning of St. Stephen around 1528. One biographical detail suggests that the design was made in the summer or early autumn of 1528. Vasari records (1550, 801; 1568, II, 208; Vasari-Milanesi, V, 163-164) that shortly after beginning work on the Christ in Glory in Città di Castello, a studio accident followed by an illness caused Rosso to move to Borgo Sansepolcro and then, becoming even more ill, to go to “Pieve a Santo Stefano a pigliare aria.” This must have occurred some time after 1 July 1528 when the Città di Castello picture was commissioned (see P.20) and before 24 November of that year when he had settled in Arezzo and had received the commission for the frescoes in S. Maria delle Lagrime (see D.31-D.34). It is quite likely that in response to the care he received in Pieve S. Stefano, which is only a few kilometers from Borgo Sansepolcro, Rosso made his drawing of St. Stephen, which Alberti engraved in 1574. Franklin placed the design during the time of Rosso’s sojourn in Arezzo because St. Stephen is the patron saint of that town and one of the most popular local saints. If done in Arezzo, I would place it at the very beginning of Rosso’s stay there, at the very end of 1528 or very early in 1529. But I am inclined to date it earlier because of the stylistic correspondences noted above. The major gesture of the saint’s left hand suggests that the engraved image is in reverse of Rosso’s lost drawing. Nothing of the setting of the scene, including the shield, drapery and sword at the left and the rocks in the foreground, seems to be due to Rosso. The pieced together architectural setting is not identifiable with that in any of Rosso’s other works. If Rosso’s lost drawing was only of the four figures in the scene, then the ring of clouds above and the radiance in it are also not due to him. Spatially, they are not really coordinated with what happens below. The counterproof of State I sold at Christie’s in 1986 (Fig.E.2a) supports the conclusion that everything surrounding the compact group of four figures was added by Alberti. It shows the figures incomplete, but already extensively engraved, as are the three columns, a small building, and the aureole of light above. The architecture of the background and the capitals of the columns are drawn in black chalk and ink by Alberti, it would seem, to serve as the model for the completion of the plate. It is likely that the figures are the same size as those of Rosso’s lost drawing, but apparently it was too small and its composition too compact for the kind of scene that Alberti wished to publish in 1575. From the evidence of another drawing by Rosso of the Agony in the Garden that Alberti engraved the previous year, Alberti might have felt the clouds and light he added stylistically compatible with Rosso’s conception. Alberti, who was born in Borgo Sansepolcro, may well have obtained Rosso’s drawing from someone in nearby Pieve S. Stefano. Alberti’s access to this drawing also suggests that it was made by Rosso after he fled Rome. Franklin noted a resemblance between Rosso’s composition and Vasari’s painting of the same subject in S. Stefano dei Cavalieri in Pisa, completed by March or December 1571 (see Laura Corti, Vasari, Catalogo completo, Florence, 1989, 147, and Maurizio Tazartes, Pittura, Cinquecento, 1988, I, 326, 328, Fig. 492). 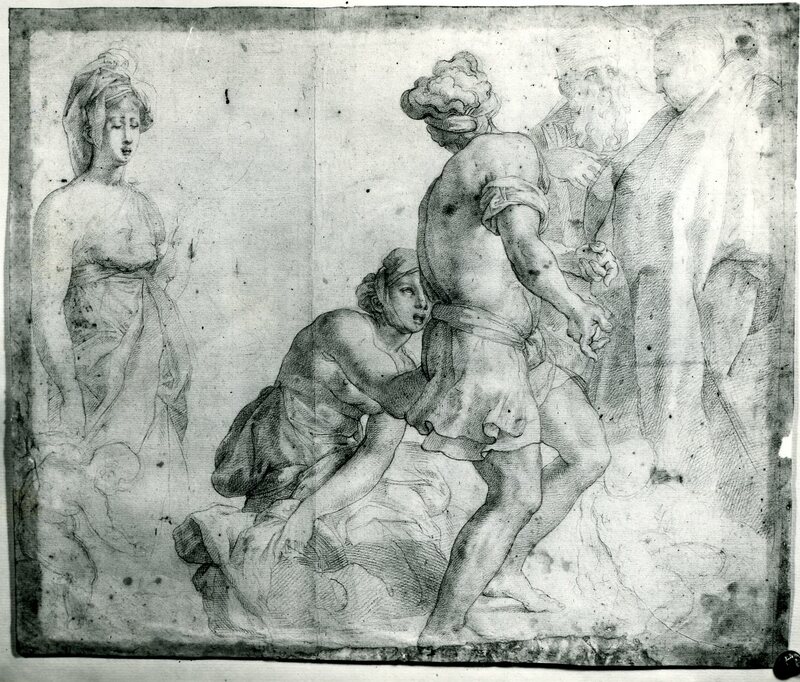 Three of Vasari’s figures resemble Rosso’s, one, however, opposite to what the drawing would have shown. As Vasari’s picture was done before Alberti made his engraving in 1574, his knowledge of Rosso’s composition would have been from the lost drawing, or a copy of it. He might have known the drawing in the possession of Alberti in Rome. The resemblance is very loose, such that Barocchi (Vasari, 1964, 66) thought of Vasari’s painting as done “alla maniera di Giulio Romano” (Fig.Vasari,S.Stefano). 1 This state is known from a counterproof sold at Christie’s, London, 1986, measuring 41 x 29.5 (see below, and Fig.E.2a). The architecture of the background and the capitals of the column are drawn by Alberti in black chalk and ink to serve as the model for the completion of the plate. I should like to thank David Franklin for bringing this impression to my attention and Laura A. E. Suffield of Christie’s for sending me a photograph of it.